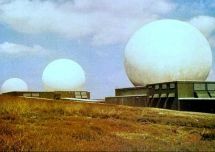 Fylingdales is one of the 3 stations in an American Ballistic Missile Early Warning System (BMEWS) chain of radars linked across the North Atlantic. It could be information from this radar station that initiates a nuclear response from the US and/or the UK to a percieved threat – real or false; intended or accidental. 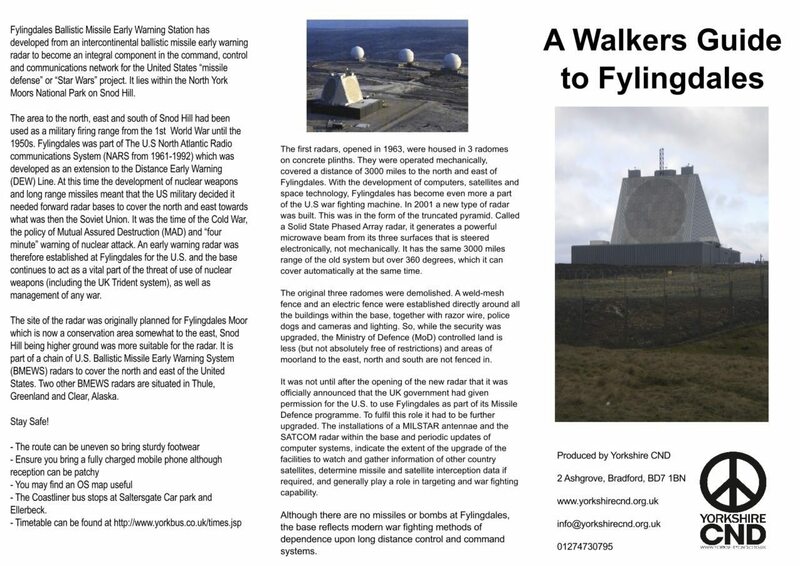 RAF Fylingdales was first declared operational in 1953 and served as a key NATO listening post during the Cold War. The other 2 BMEWS stations are Thule in Greenland – operated by the 12th Space Warning Squadron (or SWS) and Clear in Alaska – operated by the 13th SWS – both components of the USAF 21st Space Wing based at Peterson Air Force Base in Colorado Springs. The current radar system at Fylingdales is a 3-faced phased array radar that operates in the UHF (420-450 MHz) frequency range. Enhance the warfighting effectiveness of the strategic nuclear forces of the United States. The land on which the base sits is owned by the UK Ministry of Defence, but the equipment is owned and maintained by the US Defense Department. In time of war, it would provide the US President with information on what has and has not been attacked, monitor trajectories of both surveillance satellites and incoming ballistic missiles and allow prioritising and accurate response and targeting on “enemy” satellites and ballistic missiles. The base employs approximately 80 Service personnel, 80 MOD Policemen and women, and a further 200 civilian staff and contractors. One US military representative is also on the base, and a number of the contractors who maintain the equipment are from the US. The detection and identification of an Inter-continental Ballistic Missile (ICBM) targetted on the US or the UK. 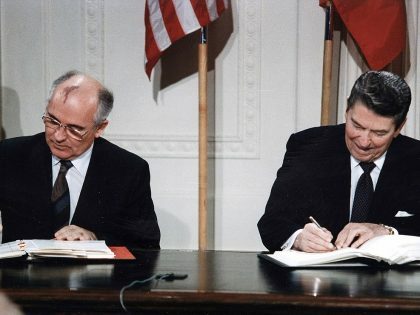 The ‘4 minute warning’ of the Cold War was derived from the approximate length of time between the point at which a missile from the Soviet Union could be confirmed and its impact on targets in the UK. The detection, identification and tracking of man-made objects in earth orbit, as a contribution to the US Space Surveillance Network (SSN). The SSN consists of radar, optical, and passive sensors located around the world. The site tracks objects in near earth orbit out to a range of 3000 nautical miles. When an object penetrates the radar’s coverage, the radar tracks the object to identify it as a missile or space object. 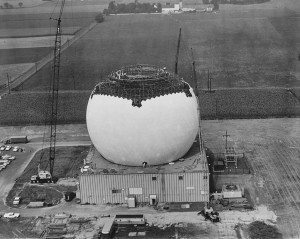 Over the course of one day, a space object can penetrate the radar’s coverage anumber of times and Fylingdales can track something like 55,000 objects in one day. As part of the identification aspect of space surveillance, the site routinely collects Space Object Identification on numerous objects. SOI can be used to discriminate between a rocket body or satellite payload. The base’s third role is to perform a UK specific mission–the Satellite Warning Service for the UK. SWSUK gives UK forces warning of surveillance by satellites of potentially hostile or other nations. Until recently, SWSUK’s primary concern was military satellites gathering intelligence. With the increasing availability of imagery from commercial sources, SWSUK now focuses on any satellite that an adversary could use to gather information on UK forces and operations. Following a required ‘Star Wars’ upgrade, the base also performs a fourth function of being an active part of the US Ballistic Missile Defense Systems aimed at shielding the US mainland from ballistic missile attack. In this role it is one of the 5 high powered of radars that cover the entire coastline of the continental United States to detect and warn of a missile attack. Fylingdales is thus part of a global system of US bases that are linked and coordinated to give warning, tracking and targeting capability for US battle management and warfare around the globe. These include Western Europe, North Africa, the Middle East, North America, Northern South America and areas of the Pacific and Atlantic Oceans for ballistic missile launches (see below). The base’s role is purely to report (missile and satellite) events. 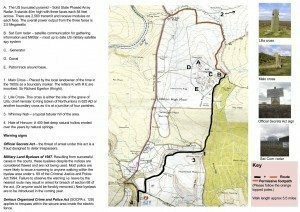 The information gathered by the radar, which stands 120 feet high on the North Yorkshire Moors, is passed to the US and UK simultaneously and those higher up the hierarchy make decisions on what to do about the information gathered from this and other data obtained from other stations. The central control for US missile ‘defence’ programmes is Strategic Command (STRATCOM) in Nebraska. See below for a description of the base’s Early Warning procedure. The information is sent to both countries via secure landline and satellite connections. The US maintains a Satcom dish at the base for use in the event of a landline fault. The dish is not available for use by the UK. The radar’s Missile Warning role refers only to Inter-continental Ballistic Missiles (ICBMs). The radar beam is 3° above the horizon and so at the limit of the beam (3000 miles) it is actually 1200 miles above the grounds. As such, the radar is not able to act as an Early Warning system for smaller missiles, such as cruise missiles, which don’t travel as high as ICBMs during flight. The radar beam constantly sweeps 360°. Each face of the three-faced truncated pyramid has around 2500 aerials on it. Should it ever be necessary, there would be room for around another 1000 aerials on each face. The aerials can change beam direction in a matter of microseconds, independently, allowing the radar to cover the full 360° in a fraction of a second. Although the beam is not designed to deliberately bend over the horizon, in certain atmospheric conditions this does happen. The radar beam has created serious concern of radiation risks due to leakage from the sides of the beams -“side lobes”. Although the radiation levels are within UK limits (NRPB), it would be harder for the base to keep within the tighter EU limits (INIRPB), which the UK may soon adopt. There is also concern that even these limits are insufficient for the type of radiation produced by the beam and that the pulsing of the radar each time it changes direction may also be very harmful. Since the missile defence function of the base will require it to pulse more often, the upgrade has caused considerable concern in the local community. Fylingdales, along with every other BMEW station is advised about a launch, as is Cheyenne Mountain and Missile Warning cell at RAF High Wycombe. Independent assessments of this early data are made in the US and UK and this data is sent to the BMEW stations. 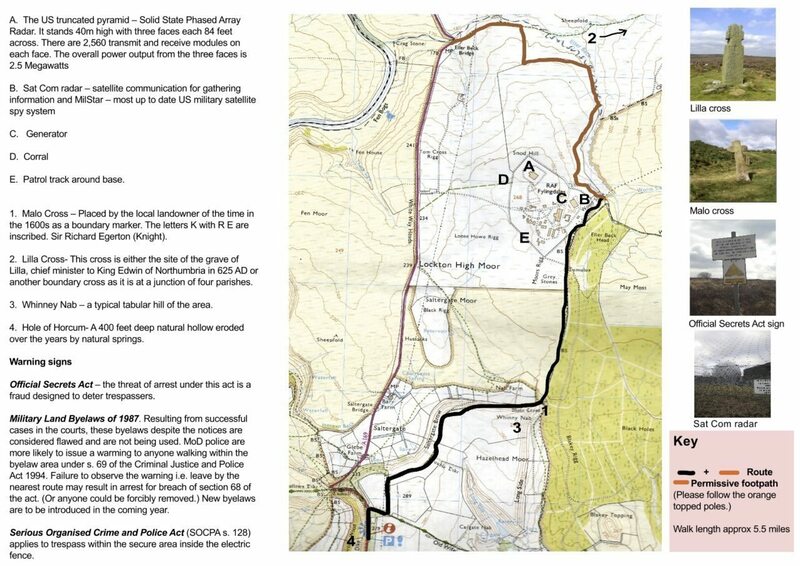 If the missile breaks Fylingdales’ beam (it will be within 2 – 10 minutes) then Fylingdales has 60 seconds from that point to make an assessment. They work out if this is a “valid event” – they don’t make a threat assessment. Fylingdales makes its assessment independently of any other BMEW station whose beam the missile may also have broken. If it is a valid event, the crew commander sends a message to the UK and US simultaneously that it is a valid event. They also supply information on the launch point, which will have been worked out, and some information on a predicted impact point. This information is refined during the missile’s flight. The information goes to the US (and Canada due to their involvement in NORAD) and the UK simultaneously for a decision. 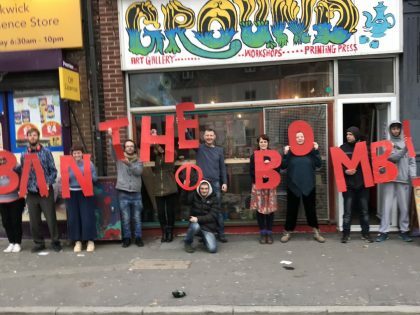 Join Yorkshire CND for the annual protest at Fylingdales during Keep Space for Peace Week 2nd week of October. Join the regular vigil at Fylingdales – a Quaker Meeting for Worship 12.00pm-1.00pm at the approach road entrance on the first Saturday of odd months. Call 01751 472827.